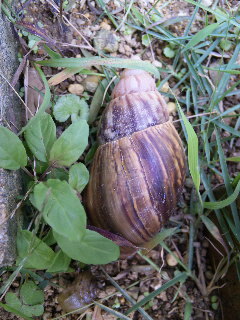 Giant African snails also ended up in Okinawa Prefecture 沖縄県 having been brought in from Taiwan in 1932. Initially, the snails were confined in a lab for breeding experiments, some, however, had escaped during the Battle of Okinawa. As in Taiwan, the snails were intended as food source for the army, as least for those stationed in Amami 奄美 (Ogasawara 小笠原 appeared to have imported its own from Java). Because of the severe food shortage immediately after the war, giant African snails became a protein source of desperation. They were ditched as soon as the food situation improved, however. The Okinawans also did not have a snail-eating custom. So the snails were simply let go that had resulted in an explosive growth as they had no natural enemies in Okinawa. The outbreaks in Ogasawara Islands and Okinawa became so bad that traveling cars regularly crushed them on highways. Worse, damage to agriculture was enormous. So snails by the truckloads were collected and destroyed. Then in 1969, cases of eosinophilic meningoencephalitis were reported in Okinawa. 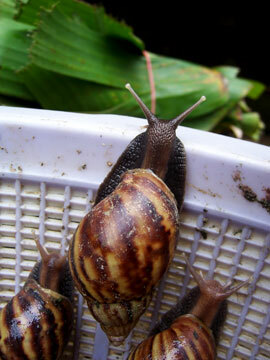 Extermination of the snails, carriers of the parasite Angiostrongylus (Angiostrongylus cantonensis), started post-haste. By 1985, routine removal in Okinawa Prefecture had seen a decline of the snail population, although not totally gone. Curiously, in Chichi-jima 父島 of the Ogasawara Islands, the snails totally disappeared in around 1989, even though those on Haha-jima 母島 remained alive and well. Cause of the Chichijima snail depletion was unknown, possibly owing to the arrival of some new predators. Giant African snails (非洲大蝸牛, Achatina fulica) can be found pretty much everywhere in Taiwan. These are not indigenous to Taiwan at all. There is a long history of how they got here. Record shows that it was Prof 下條 久馬一 (Shimojyo Kumaitsu) of Imperial Taihoku (Taipei) University who first introduced these giant snails in 1932 from Singapore; they were to be bred as a protein source. Prof Shimojyo actually had impressive credentials in infectious diseases: he graduated from Imperial Tokyo University, then became a professor at Kanazawa University specializing in typhus research before moving to Taiwan. He also headed Taiwan Tropical Research Institute and was pivotal in the formulation of leprosy managing policy. Unfortunately, snails were not his forte. The idea of snails as a food source did not work out so well at all. It might have been because of the complicated processes required to remove the slime (for the curiously minded, a good post on how to prepare the snails can be found here). The biggest problem is, however, that the African Giant Snails are carriers of 廣東住血線蟲 (Angiostrongylus cantonensis), a parasite that can cause eosinophilic meningitis. The infection rate of the parasites is a very high 50%. Even though they can be destroyed by heat at >60C, the usual quickie stir-frying is, however, ineffective. It is therefore best not to use the snails as food. As a result, the abandoned African snails were free to roam and procreate since, consuming everything green in their paths. You'd think this is a lesson learned. Well, not really. In 1980, another snail, the 福壽螺 (Pomacea canaliculata), was introduced from Argentina. Again, abandoned as a protein source, these pests now invade rice fields all over Taiwan causing tens of millions of dollars in crop loss, and efforts in eradicating them have not been successful thus far. 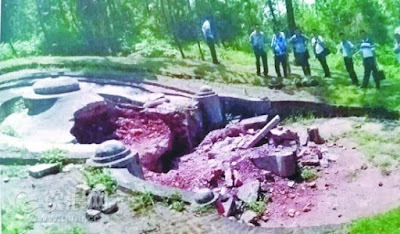 News report on 6/20/2015: the grave of Liu Yong-Fu (1837-1917, 劉永福), the famed hero of the Sino-French war, is robbed again (above). His grave is located in a small village in GuangXi Province in China （廣西欽州市欽南區沙埠鎮沙寮村). Indeed, Liu had commanded his Black Flag Army, and at the invitation of the Emperor of the Nguyen Dynasty, had successfully fought off the French invasion of IndoChina in 1873 and again in 1883 in the Sino-French war. 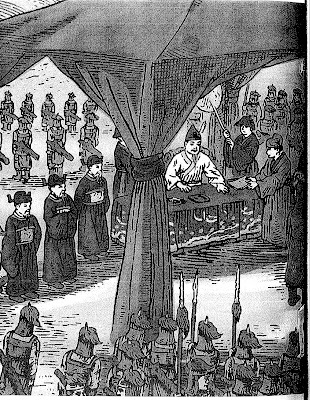 In 1894, Liu was dispatched by the Qing Court to take charge of the defense of Taiwan. He re-organized the Black Flag Army with enlistees from the two Canton provinces totaling about 8,000 men who were stationed in Tainan area. When the Qing ceded Taiwan to Japan in 1895, the Japanese military arrived in Taiwan and moved swiftly from Keelung to Taipei but ran into stiff resistance in Hsinchu area. From this point on southward, every single victory was hard won. The biggest prize in southern Taiwan was of course Tainan and the Japanese attacked the city from both the land and the sea with a force of 90,000. Two army groups approached from both the north and the south with 15,000 men landed in Putai after heavy bombardment from 3 warships, Naniwa, Yoshino, and Kaimon. Other warships also destroyed Qing gun forts along the seashore in this area. Facing the overwhelming force and the refusal of the Qing to send help, Liu decided to sue for peace. It was in fact a conditional surrender which was declined by the Japanese on Oct 8th and again on Oct 12th. In the middle of the night of Oct 19th, Liu and his son 劉成良 (commander of Kaohsiung gun fort) with staffers 陳樹南 and 柯王貴 boarded British merchant ship Thales and sailed away abandoning the Black Flag Army. On Oct 22, the leader-less Army, still well-equipped, congregated on the beach, not knowing what to do except to surrender to the Japanese. It is known that on Oct 23, only 5,100 soldiers were shipped to Kinmen (no record of if they had safely arrived). Between Oct 22-23, about 1,000 were massacred by the Japanese for refusing to hand over weapons and personal belongings, and another 116 died from starvation. This was the true legacy of Liu Yong-Fu in Taiwan. The appearance of Koxinga remains unclear to this day. Philip Meij might have been the only one who gave a somewhat detailed first-hand description of Koxinga. Besides large teeth with gaps inbetween them, Meij had also noticed Koxinga‘s big and black eyes that darted around, his sparse beard that reached down to the chest, and that he spoke/barked with a severe and agitated voice 【translation of the diary in Chinese: "他眼睛又大又黑，那對眼睛很少有靜止的時候，不斷到處閃視...鬍子不多，長及胸部。他說話的聲音非常嚴厲，咆哮又激昂"】. Since the names of Koxinga's generals spelled in Dutch were based on Hokkien, the latter was probably the language used by Koxinga in daily conversation (in addition to Mandarin官話 and Japanese). Perhaps the most interesting aspect is that Meij saw a bearded Koxinga that seems to confirm that portrayed in paintings commissioned (allegedly) soon before his death in 1662. In the Cheng Family tradition, men are always clean-shaven and mustaches/beards are kept only when in mourning of parental deaths. It now appears that Koxinga was still remembering his mother Lady Wen's untimely demise. Meij night have also exaggerated Koxinga's eyes. 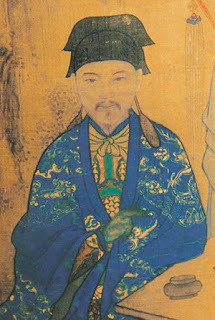 In the portrait of a middle-aged Koxinga (above), his were the classical phoenix's eyes (鳳眼), not "big and dark" that usually depict bandits and criminals. Philip Meij was a land surveyor employed by the VOC, trapped inside Ft Provincia when Koxinga's fleet entered Tai Bay on April 30, 1661 (for more, see here). He was released and left for Batavia with Coyett and remnants of the VOC on Feb 9, 1662. During this 9-month period, he worked for Koxinga not only in land surveys but also in translating letters from Koxinga to Coyett. Most importantly, Meij had written a company report based on his daily recalls after his safe return to Batavia. This diary complements, although is far more informative than Coyett's memoir of the siege of Ft Zeelandia, as it recorded activities unknown to Coyett. In addition, major events described in the diary also in most part agree with those archived by the Cheng court scribe 楊英Yang Ying, and the account of a near-contemporary historian 江日昇Jiang Ri Sheng. Meij's Dairy was translated from archaic Dutch into Chinese by 江樹聲Jiang Su-Sheng and published as 梅氏日記 in Taipei in 2003. The diary told of the many unsuccessful attempts by Meij to reach Ft Zeelandia, the fate of the surrendered Dutch men, women, and children, the iron-fist rule of Koxinga, and the Ming-Cheng interaction with the Aborigines. On May 5, 1661, while negotiating the surrender of Ft Provincia, Meij noticed 16 Aboriginal VIPs waiting outside of Koxinga's tent. They were the chiefs from 5 clans of previous Dutch colonial subjects, now all dressed in blue mandarin robes embroidered with gold and silk threads. Clearly, Koxinga was on good terms with Aborigines in the greater Sakam area. Not all Aboriginal tribes were friendly, though. Some activists in Taiwan now decry the genocidal atrocity perpetrated on the Aborigines by Koxinga (and later his son Cheng Jing). This was not without provocation, however. The major problem for Koxinga in the battle against the Dutch was the lack of enough food for his soldiers. He might have underestimated Coyett's resolve in defending Ft Zeelandia to wait it out for rescues from Batavia. A long siege must base on sufficient provisional reserve and Koxinga had great difficulties in getting re-supplied from his home base in Hokkien. The strategy was then changed to assigning his soldiers farming duties. Each military unit of 1,000-1,200 men was given a territory to build a town in the center and garrison forts in the periphery. There were also strict orders to leave current land ownership of both Han and Aboriginal undisturbed. And the land to be developed must meet certain farming standards complete with irrigation canals. Meji's surveyor skills were put in good use to erect the boundary markers of each territory. Along the way, for about 180 km north of Ft Provincia, Meji reported seeing men in groups of 100 busy planting sweet potatoes for immediate needs while getting the fields prepared for rice growing for the next season. 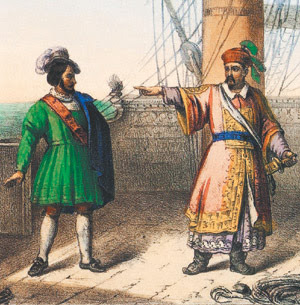 Of Koxinga's force, 11,000 to 12,000 men were sent to the north and 6,000 to the south leaving only 300 guarding Ft Provincia, now Koxinga's command center, and 5,000 to enforce the siege of Ft Zeelandia. Both the north- and south-bound forces quickly ran into Aboriginal hostilities. To the north, the Prince of Middagh (大度王） lured the Cheng frontier army into a false sense of security and murdered 1,400 to 1,500 of them in their sleep, the rest escaped into sugarcane fields and were smoked out and killed as well. Also lost was 陳澤Chen Ze who defeated Capt Thomas Pedel and his 120 musketeers on the beach of 北線尾Baxemboy. To the south, according to Albrecht Herport (an artist-soldier, either a German or a Swiss, working for the VOC), 700 to 800 soldiers were killed by the Aborigines after being surrounded; of the 5,000 Han and some straggler Dutch civilians in this area, most would also die of starvation and disease. Meij recalled the Cheng soldiers "using their heavy weaponry and shamelessly asked for hospitality from the Aborigines". Some modern-day historians would point to this passage as evidence of maltreatment of the Aborigines while it might simply be a hunger-driven behavior. Regardless, the Ming-Cheng Kingdom would later mount punitive actions against these murderous Aborigines.